Sink and float! A fun bath time game for your toddler! A Toddler Bath Time Adventure! Preparation time: Sink and Float simply requires a few moments to gather your bath time props. Clean-up time: None - unless things get a little too enthusiastic! What you will need: Lots of props to use in your Sink or Float experiments! Toys, empty plastic containers, styrofoam trays, balls, wooden blocks and smooth, polished river rocks make good sink and float materials. Use your imagination, but stay away from anything that could break, such as glass jars, and make sure that smaller objects are not of choking hazard size. 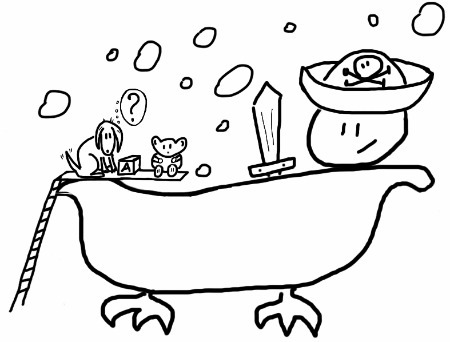 Set up a nice selection of objects on the edge of the tub, and plop them into the water, one by one. As each one drops in remark on what they are doing. "Wow! the block sinks!" or "Here comes the tray, oooh it floats!". Then retrieve the objects and do it again! After a few turns you can start asking your toddler to predict what will happen. He does not need to answer, just asking the question will prompt him to think about it. Give him a few seconds to guess, and then say "let's find out!" and let the object drop. Again, comment on what actually happens. As your toddler gains experience with the objects his predictions will be increasingly correct. Soon he will want to take over the game and drop the objects himself to witness their often gravity-defying properties and to confirm his own predictions! When the objects are no longer fascinating, mix it up! Bring in the sponges, the cardboard and the paper boat! What will sink and will float? The answer is not obvious! Sometimes it depends on the shape of the thing and other times it depends on if it is hollow or filled with water. Toddlers love to explore the properties of everyday things, so raid your recycling for a selection of bath time science props! Add bubbles to the water for an element of hide and seek!